I love Chicken Salad! It’s one of my most favorite lunches. 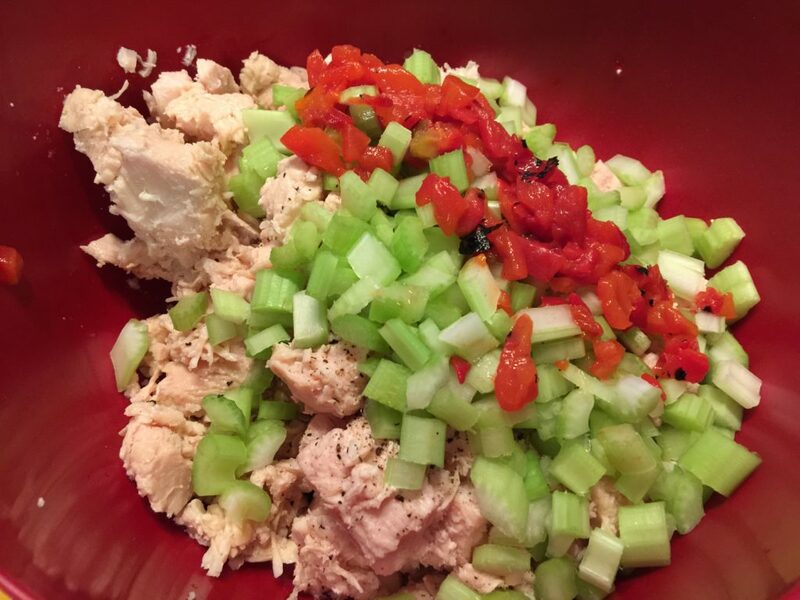 But adding in roasted red bell peppers to make Red Bell Pepper Chicken Salad, kicks it up a notch! 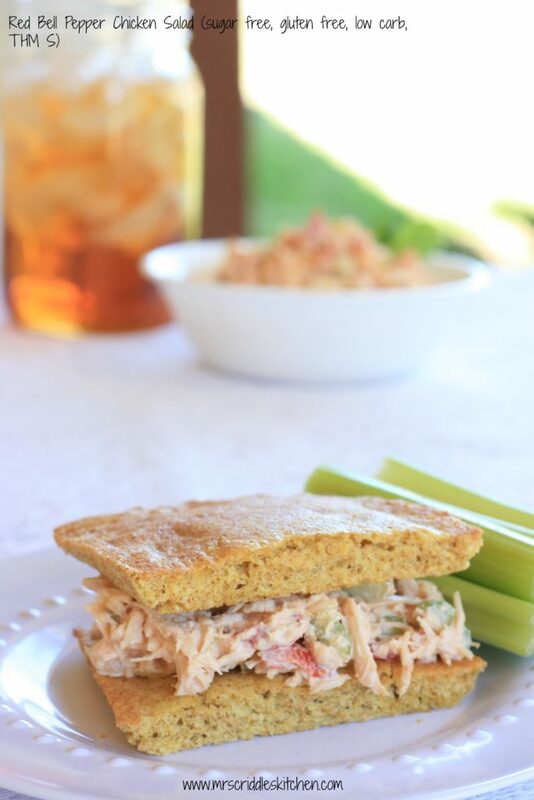 This lunch is on the easy side using canned chicken but you can use rotisserie or shredded chicken as well! I used the 3 lb can from Sam’s. After you drain it, it gives you about 2 lbs of chicken. Next, you have to have the Mezzetta Red Bell Peppers, ok well you don’t HAVE to have them but it really makes this dish!! Also, you want a good real mayo or you can make your own!! 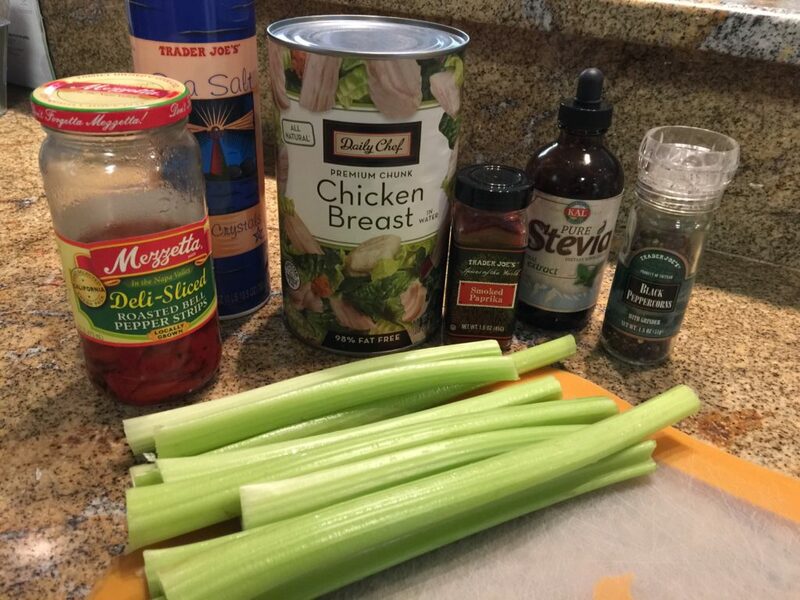 Chop all the ingredients up well and add to the chicken. <—click here (affiliate link). But you can use any sweetener you want too! 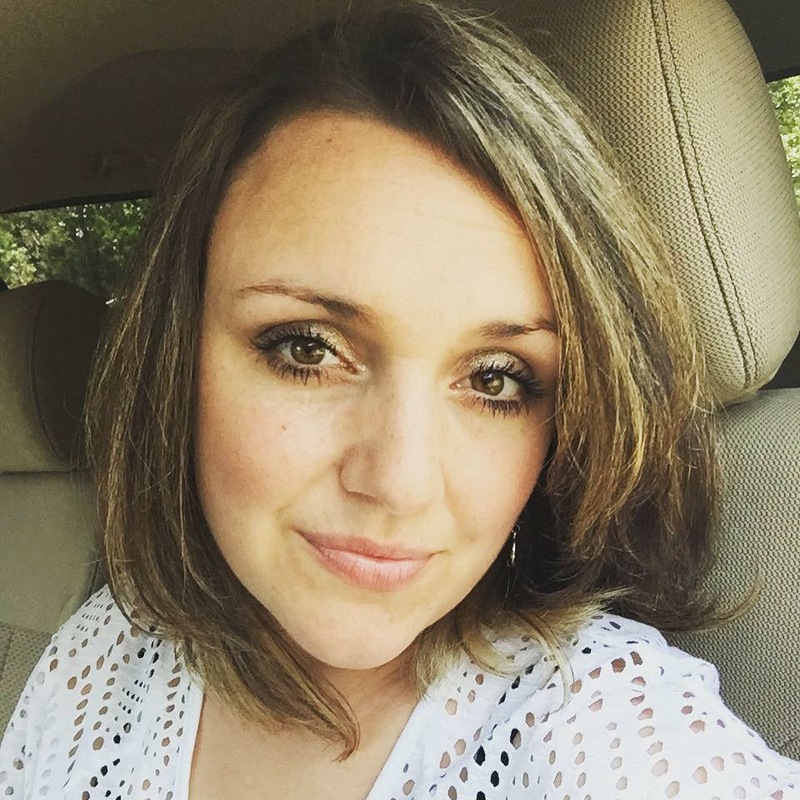 You can also go to the Trim Healthy Mama store <– click to go to the store (affiliate link) and by an on plan sweetener like THM Sweet Blend which I LOVE and Pure Stevia or the Erythitol!! Now for the breading, I took the recipe for the Bread in a Mug on page 265 of the Trim Healthy Mama Book and mixed the ingredients but used butter instead of coconut oil. I sprayed a glass baking loaf dish, put the bread mix in and microwaved it. Once it was finished, I flipped it out and toasted it in the oven for a little bit with a touch of butter on top… so sooooo good! I cut each bread in half to make a sandwich. I made two… one for me and one for my daughter. This chicken salad feeds several. You can take this to an event or party with crisp veggies instead of bread or you can place this into a wrap or even toast up Joseph Pita’s to scoop it out with! 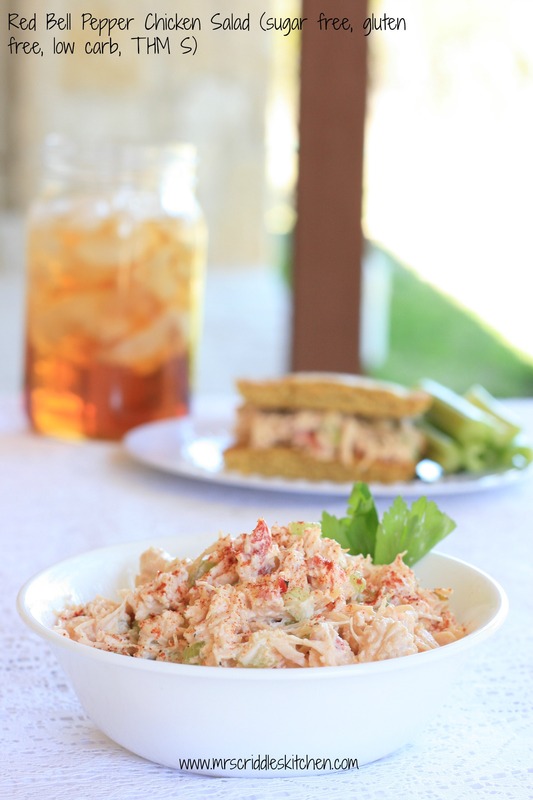 A slightly sweet and crunchy chicken salad with a flare! THM approved! 1 Bread in a Mug (S) recipe (pg 265) for one sandwich, replacing coconut oil with butter. You can also use the NEW THM BAKING BLEND!! Chop up the chicken if it is rotisserie. Drain the canned chicken (if using can) well. Chop all vegetables as needed. Add mayo, sweetener, and seasonings. Spray or butter a loaf pan. Mix bread in a mug ingredients from the Trim Healthy Mama book. 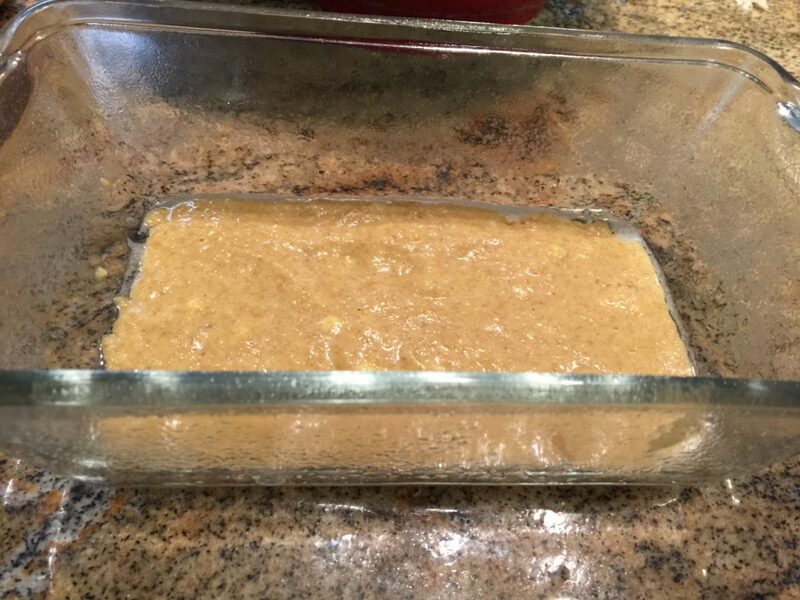 Place Bread in a Mug batter into the loaf dish and microwave. I love chicken salad. This recipe looks delicious—I can’t wait to try it! I am so making this today! It looks amazing. Thank you for sharing this recipe 🙂 Always looking for new ideas while THMing. 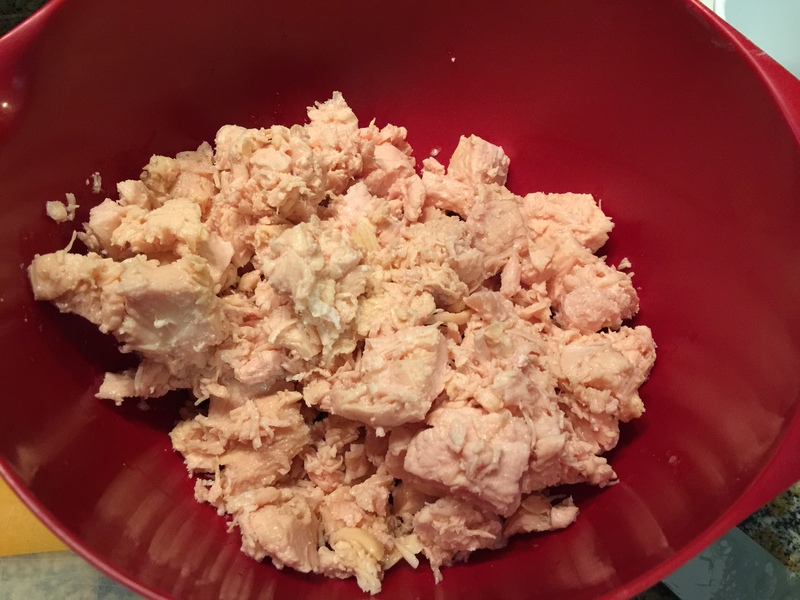 amazing chicken salad…..so glad to have something to change up my usuals! This sounds absolutely wonderful!! I am just starting THM (this is my second day) and i am so nervous. lol You are such an inspiration. Sounds wonderful! 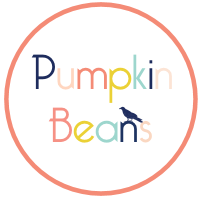 New to THM and your page and I can’t wait to try out some of your recipes! I just bought the ebook yesterday and plan to start next week. My family loves chicken salad sandwiches so im excited to try your recipe. Thanks for sharing. Oh my Mrs. Criddle! As soon as I saw your Red Bell Pepper Chicken Salad, I pinned it! Looks so delicious and I so happen to buy the exact same roasted bell peppers.. Thanks for. Recipe!! Can’t wait to try it.. This looks so yummy! I LOVE chicken salad. This looks amazing! So excited to try it 🙂 Thanks for all your wonderful recipes! Thank you so much for this recipe. It was just what I needed. Thank you so much for this recipe, It was just what I needed. 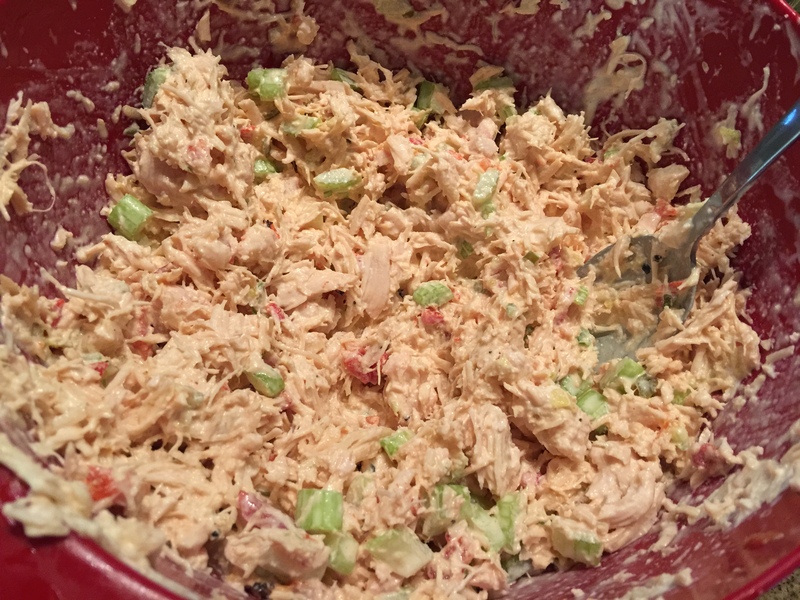 I have been looking for a chicken salad recipe that I could take to work and this looks perfect….thanks for sharing your THM recipes, this mama appreciates it! This looks so yummy! Thanks for all the THM recipes! I can’t wait to try this. It will work great for my lunches at work. Yumm! Can’t wait to try this one! Can i eat this with a pita and i used ff mayo wouñd that still make it an S ? You would have to keep the mayo really light… you could probably use greek yogurt instead?! Amazing! Made this for lunch today and both hubby and I LOVED it! 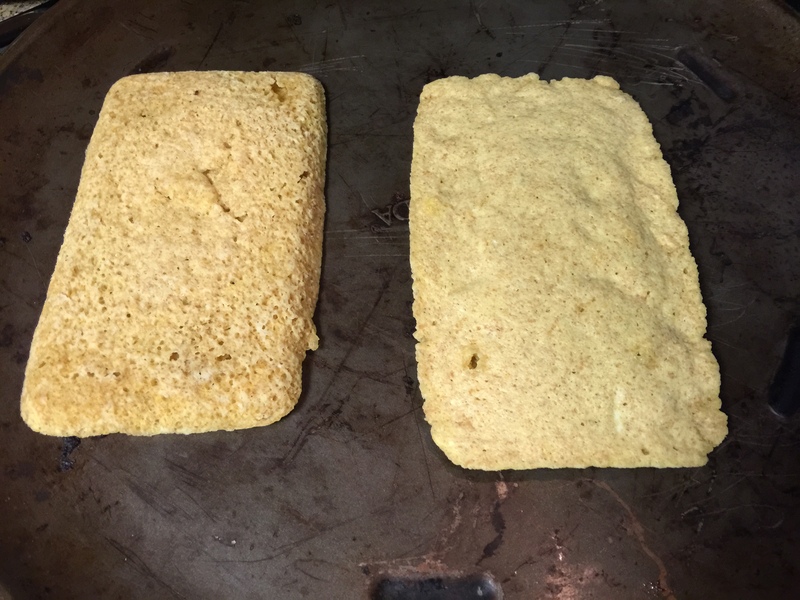 Still new to THM…question…would this still be an S on sprouted on-plan bread? And yes… Mezzetta peppers are the best! 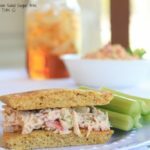 If you used the sprouted bread that would be a crossover but still on plan! You could also make the WWBB Bread from the THT cookbook and use that!